Save money and avoid vacation rental listing site booking fees by booking directly with us! Give us a call at 760-803-1740 or send an Inquiry. Picture yourself relaxing at the beach while enjoying this modern, luxurious and spacious single family home, just steps to Carlsbad Beach and the Pacific Ocean. Large Family Home - 3 Bedrooms/2.5 Baths - Sleeps 6 - Ocean Views. 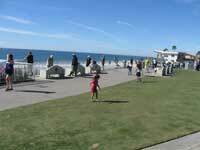 Enjoy breakfast on the roof garden with ocean views and planning your day: Doing Nothing, Sight Seeing in Southern California, Boogie Boarding, Legoland (two miles), Coaster train to Downtown San Diego (10 minute walk), or Beach Sitting. After your day return home where the views and main living areas are on the second floor. 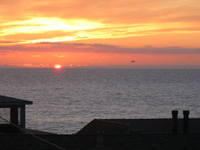 Have a BBQ on the roof garden as you watch the Sun Set into the ocean. Don’t want to cook? Plan a ten minute walk to the Village to enjoy one of over 50 restaurants for dinner. From the first floor foyer of this gorgeous home there is a Bedroom/Den with two twin beds, Guest Room with a queen bed and a full Bath. On the second floor enjoy Sunset Views from the Great Room, Dining Room, Kitchen. The Great Room has a flat screen TV, DVD, and fireplace. The large Kitchen has a granite breakfast counter and is fully furnished with everything you need. Master Bedroom has a king bed and a flat screen TV. Sleep to the sound of the surf. Master Bath has custom 2 person shower. Wireless High Speed Internet is available throughout the home. Also included are phones with unlimited long distance calls in contentienal US. The Roof Garden has a gas barbecue and Patio Dining area and makes for great indoor/outdoor living for the early morning cup of coffee or watching for the Green Flash at Sunset in the evening. Home has a two car Garage for off street parking, a washer and dryer and lots of storage. This luxurious and enjoyable beach home is available for your family vacation or your corporate housing needs. The home is fully furnished and equipped with everything you need to make your stay enjoyable. We are certified as CHBO Complete® by Corporate Housing By Owner to meet the needs of corporate executives being relocated or needing extended stay housing while in the San Diego or South Orange County area. This is not a party house. If you are looking for life on the wild side, please check out other properties. This home is located in a neighborhood and we must respect our neighbors. We love children. 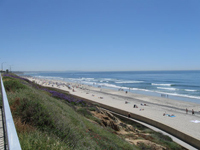 Rated as one of the best family beaches in the U.S.A., Carlsbad beaches provide plenty of opportunities for family activities such as surfing, swimming, volleyball, picnicking, beachcombing, building sand castles or simply relaxing and sunbathing! 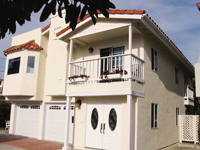 This property has City of Carlsbad Vacation Rental Permit No. BLRE1242692.